High-quality content for Drug & Alcohol Rehab Centers who want more patients to find them, call them & enter treatment. Discover how one drug & alcohol rehab center went from losing money on mediocre content... to a 1150% higher call rate and consistently filling their 400-bed inpatient program. By using a quality content creation partner, this rehab center went from 400 calls a month to 5000! Admissions grew by 900%. Up from 10 new patients a month to 100! From mediocre content with low call volume and poor admission rates... to a 1150% higher call volume and a 900% higher admission rate. Here’s what they did to get content that is evergreen, informative, and high quality. Palm Partners relied heavily on Pay-per-Click (PPC) to drive more visitors and get in touch with more potential patients. But their campaigns were getting more and more expensive without returning the investment. Their campaigns quickly became uncontrollable expenses with no long-term value. Instead, they turned their focus to content marketing for attracting more visitors and patients, hoping to do so at a lower cost with more traffic, calls, and new patients. Palm Partners had to compete with thousands of other treatment center websites. They tried hiring in-house writers to produce content, but the costs of employing full-time writers outweighed the return. The mediocre content resulted in low site traffic, low call volume, low admissions, and an overall low return on content investment. To be successful, they needed to regularly produce optimized content on evergreen topics that people are searching for. The Palm Partners team found it just as tedious to work with contract writers, who often missed deadlines and did not maintain quality standards. After being disappointed by several other content marketing services, Palm Partners ultimately hired ContentWriters. ...Without the cost of full-time writers or the hassle of unreliable freelancers. Higher call rate, increasing from 400 calls a month to 5000. Higher organic traffic numbers with evergreen content that will continue delivering visitors for years to come. Higher admissions rate, moving from 10 new patients a month to 100. While the Palm Partners team is busy with patients, ContentWriters develops topics, oversees content production, and sends new high-performing content to Palm Partners on a regular schedule. On top of it all, this has helped Palm Partners lower their overall marketing costs, too. All the Palm Partners team has to do is approve & click to post the content. Get started today with high-quality content that can attract potential patients and increase your admission rates. See for yourself the difference content from ContentWriters can make. 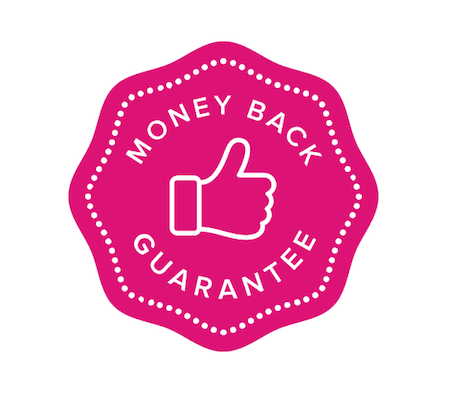 Our 100% money back guarantee ensures that you will be satisfied from the start. You’re just a few minutes away from your first piece of content. If you’re looking for bulk orders or continuous content creation, we’ll gladly walk you through the process. What if I want to talk to someone before I buy? We’re always here to help. If you would like to talk to a content strategist about long term content creation, please call (212) 235-1103. You’ll be in good company. Plagiarism check to ensure original content. Extensive research on behalf of our writers to ensure their content is on-brand with your company. 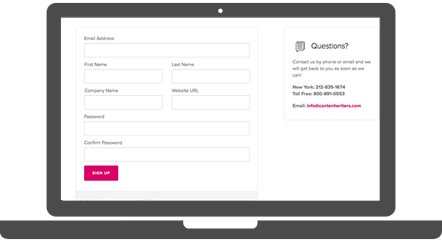 Our simple 4-step process makes ordering content easy. ContentWriters clients receive an account to help them manage their content. Sign up on this page to open an account with us. 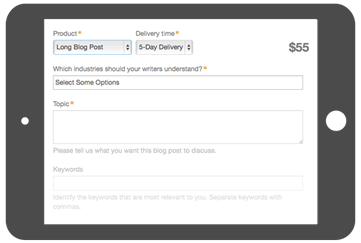 Ordering content on ContentWriters is easy. We guide you through your order by asking you questions about the content. Order as much content as you need with our simple bulk ordering feature. Review your order in the shopping cart. Proceed with your order by making a payment. Manage orders on your dashboard. Track orders in progress, review completed orders, order new content, and view your content calendar easily. More Questions? We have answers! Who is my content written by? At ContentWriters (CW), we work with an expert team of professional freelance writers. CW's writers are all based in the U.S. and are assessed through a rigorous vetting process which includes language proficiency testing, writing sample evaluation, phone interviews, and test assignments. We individually match writers with assignments based on their background, credentials, and writing experience so you can be confident in our product every time. When do I pay for an order? All orders are paid for when they are placed. 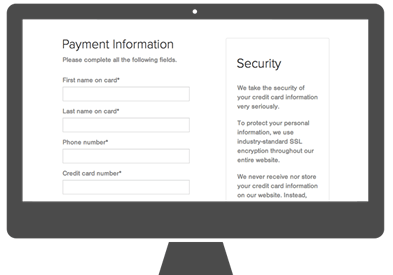 Once your payment information has gone through, we’ll go ahead and assign your content to an expert writer. (This isn’t always true, especially for subscribers). Can I request changes to my order? Revisions are included in every order. If you would like to change something, we are happy to revise to better fit your requirements. *Please note that the revision request must stay within the scope of the original job order. Will my content be original? Your content will always be original. All orders are screened through a plagiarism detection service to make sure your content is 100% unique. How is my content delivered? 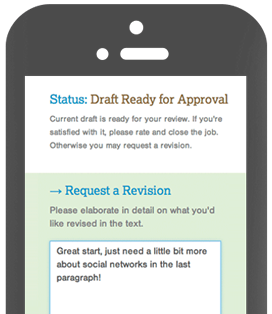 Once your assignment has been completed, you will receive an email notification alerting you that the content is ready. You can also sign into your account on our site to directly view all of your content on your dashboard. Do you supply images with my content? If you need images for your content, don't worry! CW can provide you with high resolution stock photos for an additional fee. If you have any questions, feel free to reach out! You can email us at info@contentwriters.com or call (212) 235-1103 to speak with a content strategist. ContentWriters is committed to redefining the standard in content marketing excellence. Our ambitious team works diligently with expert writers to ensure that your business becomes the authoritative voice in your industry. A steady stream of high-quality, written content transforms businesses at a higher return than traditional forms of marketing, and we can prove it. We’ll pair you with professional, expert-level writers who understand your unique business goals and can help you meet them. We work hard to be more than just your content provider - we’re the content team you always needed. Our army of writers produces hundreds of pieces of content every day, ensuring that every content marketing task is well within reach.